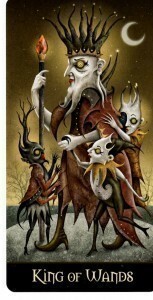 Welcome to the last stop on the Tarot Blog Hop…if you are going from 0 to 21. You may have started somewhere else so you will continue on. Perhaps you are one of our Discordian friends.. Welcome to the beginning in that case. The topic this hop is to each pick one of the Major Arcana. We chose the World. Why? 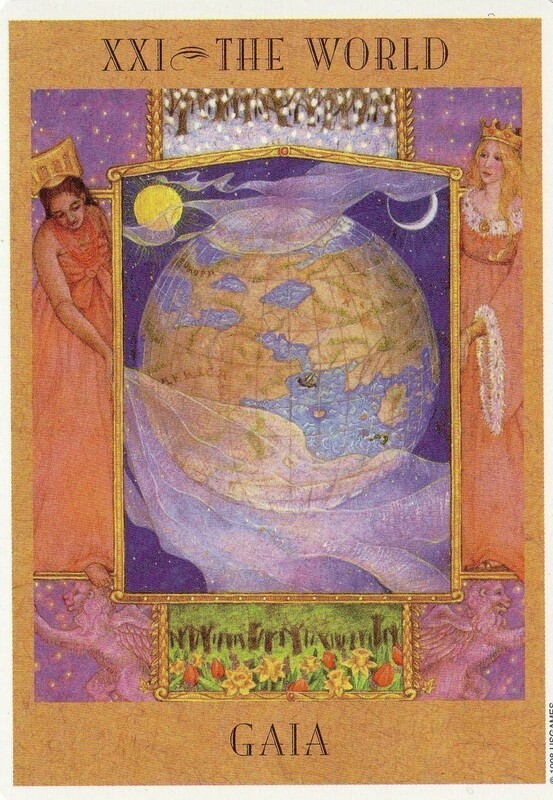 Well, Tarot is our world. 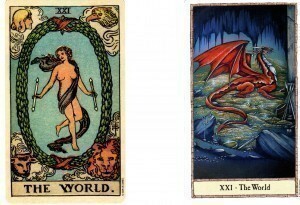 We love bringing you all the different types of Tarot– from Marseilles to Thoth to the Rider Waite style. Then there’s the Kipper cards, the Lenormands, the Oracles from Angels to Mermaids to Tea Leaves. Want to browse our world a bit? Our catalog is now available online for your enjoyment. We hope you enjoyed these images of the World from just a few of our decks. Remember to leave a comment before you go. We love knowing you were here. 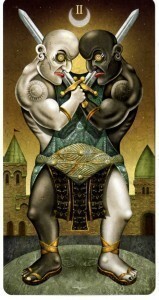 This entry was posted in Decks and tagged Catalog, Deviant Moon Tarot, goddess tarot, Hobbit Tarot, Japaridze Tarot, Rider Waite Tarot, Tarot Blog Hop on June 21, 2015 by USGS Staff. 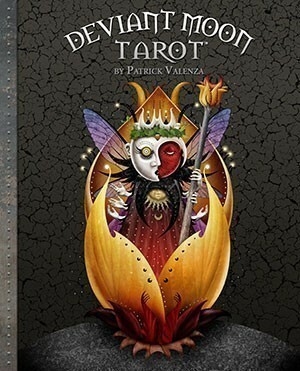 Please help us welcome Patrick Valenza creator of the Deviant Moon Tarot, the borderless Deviant Moon Tarot and the Deviant Moon book. Interviewed here by Arwen Lynch, he shares thoughts on both versions of the Deviant Moon as well as his Deviant Moon book and his process. 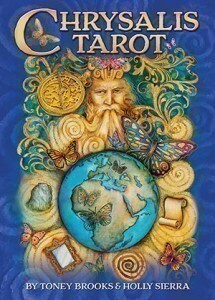 Arwen Lynch: Who or what first interested you in the tarot or in oracle cards? 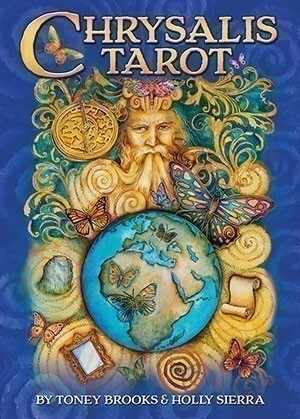 Patrick Valenza: I discovered the tarot when I was about eight or nine years old back in 1975. The images fascinated my young mind and I studied them intently. While most of my friends copied drawings of Batman or Superman, I was busy designing the Fool and the Magician along the margins of my schoolwork. AL: What is your favorite card in the deck? 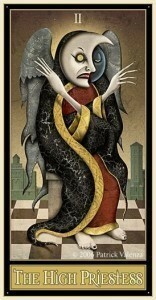 PV: My favorite cards tend to be the darker ones, such as Death, the Devil and the Tower. My least favorite has always been the Hierophant. Arwen Lynch: What was the first deck that truly inspired you? PV: The first deck that inspired me as a child was the 1JJ Swiss deck as well as the Rider-Waite. When I became a teenager, I discovered images of the Visconti-Sforza Tarot, which inspired me to try and create my own hand-painted deck. The hand-painted deck I made in my adolescence later became the Deviant Moon when I reached middle age. AL: What card in the Deviant Moon was the most challenge to paint? PV: The most challenging aspect of the deck was trying to create custom gold coins for the Suit of Coins out of clay, which I then photographed and put into the art. So difficult, in fact, that I scrapped them and changed the suit to Pentacles after I had already submitted all the artwork to U.S. Games Systems for final publication. The coins just ruined the deck, however I may try them again in a future tarot project. AL: What lessons did you learn along the way? PV: I learned a great deal of technical skills during the deck’s creation, such as Photoshop and digital photography. Up until the Deviant Moon, I was mainly a draftsman working in colored pencil. AL: What card was the most challenging to write about for the upcoming companion book? PV: Writing for the companion book was the most challenging project I ever worked on. I created the artwork for the Deviant Moon subconsciously. Writing about it made me stop and analyze the aftermath of it all. The book took almost three years to write. At times, I would spend days trying to find the right words for a simple paragraph. It was quite an accomplishment for me to finish it and my reward came when I hand delivered it to the good folks at U.S. Games Systems last spring. AL: How do you deal with creative block issues? Do you have any suggestions for those reading this? PV: When I get creative blocks, I get out of my own way and let my unconscious mind take control. This is the part that connects best to my Muse. I just keep working until I get it. I usually figure out an artistic problem when I am waiting on line at a supermarket, driving, in the shower, or doing other mundane things that have nothing to do with my projects. AL: What has been your greatest joy about the launch of your borderless deck? PV: The borderless Deviant Moon came out over five years after the original. To me, it seems as if it is an entirely different deck and has its own personality. I am thrilled to see that so many feel the same way. AL: What surprised you the most about creating your deck? PV: The greatest surprise was how the deck connected me to so many people around the world. I love to hear from folks who say they were inspired in some way by the Deviant Moon. 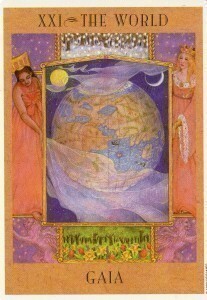 AL: Name three people who are personal inspirations in the tarot or oracle world? 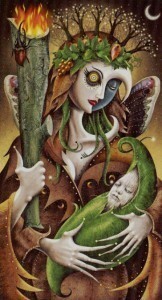 PV: Without question, Stuart Kaplan was my greatest tarot inspiration. When I discovered my first tarot deck as a boy, I was curious to know where these amazing cards came from, so I looked on the back of the box and saw his name. I used to think he was a wizard of same kind! 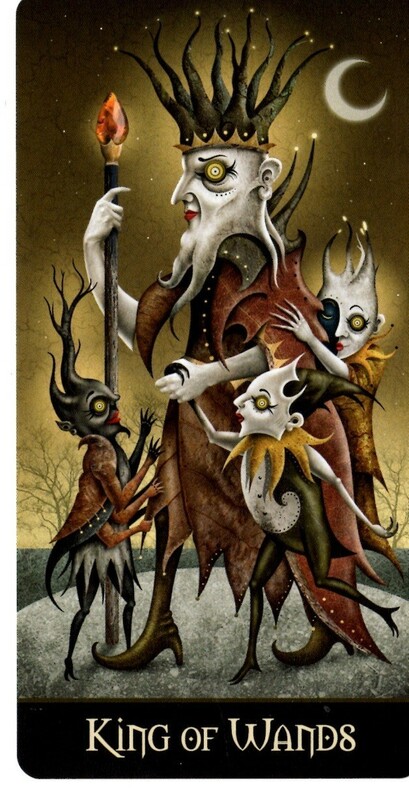 I also admire Paulina Cassidy for her magical illustrative style, as well as Lisa Hunt for her wonderful artistry and work ethic. AL: Who are your favorite artists? PV: My favorite style of art comes from pioneering animators such as Max Fleischer and Winsor McCay. I also admire all the unknown medieval woodblock cutters who created early tarot decks. Other favorites are Joan Miro, Max Ernst and Picasso. AL: What do you do in your leisure time? PV: In my leisure time I enjoy working on my creations. Luckily for me, work and play are the same. AL: What is one piece of advice you would offer someone who wanted to create his or her own deck? PV: My advice would be to love it or leave it. You need to put your entire soul into an undertaking such as this for many, many years without expecting any reward in return. There are a zillion decks out there already. Make yours unique! Give it everything you’ve got! AL: What does the future look like from your side of the computer? PV: Right now I am working on three different decks at the same time, as well as a children’s book that I want to finish. The Deviant Moon has a sister deck, which I hope to submit for publication very soon. Visit Patrick’s Deviant Moon site to learn more about his process and projects. This entry was posted in Authors and Artists, Decks and tagged Artists, Authors, Borderless Deviant Moon Tarot, Deviant Moon Tarot, Patrick Valenza on February 12, 2014 by USGS Staff. Let’s take a look at the Ace of Wands. Traditionally this card is read as the start of a creative project when upright and a lack of creative passion when reversed. 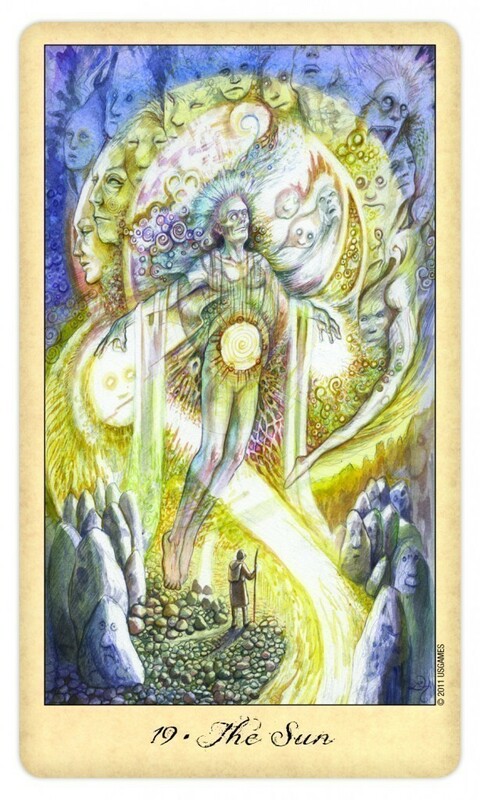 How does the message of inspiration and creation get changed or enhanced in the four cards. Leave your thoughts in the comments. All commenters will be entered in our December drawing so make sure you leave us a working email. Thanks. This entry was posted in Decks, Tarot Symbolism, The Cards and tagged Ace of Wands, Aces, Cat's Eye Tarot, Deviant Moon Tarot, Rider Waite Tarot, Thoth Tarot, Wands on December 16, 2013 by USGS Staff. When the Sun shows up in a reading reader and client alike find themselves smiling… What’s not to love about the light, warmth and joy of the Sun card?! 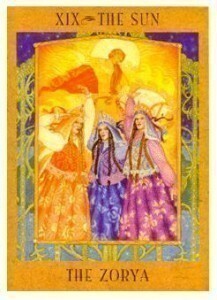 It’s a card of success, healing, clarity, power and happy endings. It shows that you have what it takes to overcome whatever it is you are facing. It could mean recognition and high honour. But is it always a happy, pleasant and positive card? Egotistical, haughty, overbearing, dictatorial and judgmental. OR lacking in confidence, power, vitality and self-esteem. 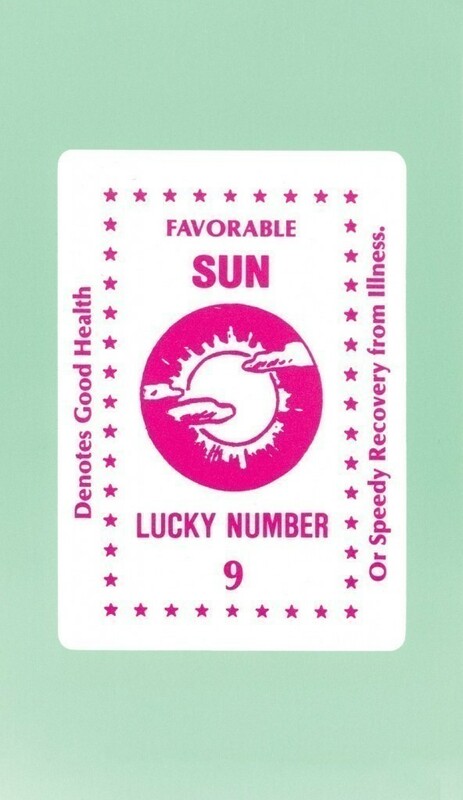 The Sun can also represent burn-out or burning your candle at both ends if negatively aspected by surrounding cards. 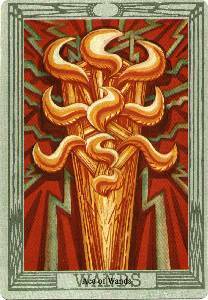 A classic example would be The Sun flanked by either the 10 of Wands or the 10 of Swords. 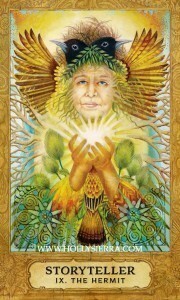 As a card of emotional healing, The Sun points to issues around confidence, personal power and self-esteem. In the chakra system, we would place The Sun (quite naturally!) in the Solar Plexus chakra. Too much of the Sun energy makes a person overbearing and lacking in empathy/understanding. Too little can lead to a victim mentality, boundary issues or being easily swayed by the opinions by others. 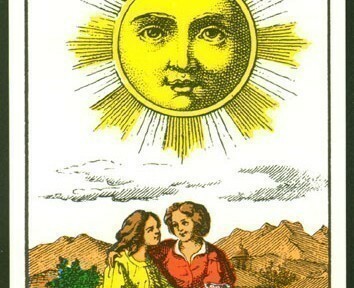 To find out what The Sun means in readings about love and romance, click HERE. 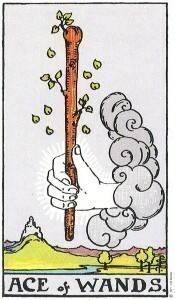 3 of Wands (Sun in Aries). Healing is found through encouragement (giving and receiving, but more often giving). 10 of Swords (Sun in Gemini). Learning to see the silver lining and the joy of starting over. 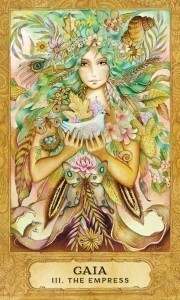 8 of Pentacles (Sun in Virgo). Being responsible for one’s creation whether this is work, physical health or a relationship. 6 of Cups (Sun in Scorpio) – Making peace with the past (including past lives) and letting go of energetic bonds to people who have left us for various reasons. 4 of Pentacles (Sun in Capricorn) – Having firm personal boundaries. This entry was posted in Decks, Tarot Symbolism, The Cards, Uncategorized and tagged 1JJ Swiss, Deviant Moon Tarot, ghosts and spirits tarot, Goddess, Sun, Zolar's Astrological Tarot on November 14, 2013 by USGS Staff. Here is the King of Pentacles sample page from the Deviant Moon Tarot companion book. The stout King of Pentacles proudly displays the silvery emblem of his industrial dynasty. He is a powerful individual, who has worked diligently through the years to attain his status. Unlike other kings, he does not rest on his riches. He involves himself in every aspect of his kingdom, from major to menial tasks. Being a perfectionist, he often toils inside the factories alongside common laborers, making sure each product meets his strict specifications. The king's impressive crown of smokestacks shows that business is always foremost on his mind. Unfortunately, this preoccupation leaves little room for spirituality. The pressure gauge fixed in the crown’s center signifies mental stress, which is inherent to his position as an executive. When the meter gets too high, the king releases steam and converts his tension into useful energy. The king’s mighty suit of armor conveys his steely determination to succeed. He has fought hard to build his empire, and he will do anything necessary to maintain it. However, underneath that worn exterior, there may be a woman dying to break free! Such femininities include a studded kilt, high-heeled shoes, earrings, polished fingernails, and the dainty way in which his pinky sticks up. These attributes subtly express his soft caring nature, which he often has to hide when dealing with ruthless business competitors. One might also interpret the king as a female who has assumed masculine qualities in order to compete in a male dominated world. 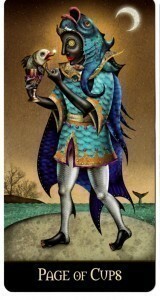 The King of Pentacles signifies an enterprising figure that will likely become wealthy through his business ventures. This captain of industry is not only a strong administrator, but he is also an authority in his field. He is a wise investor and is proficient in all types of financial matters. Learn all you can from this shrewd character! Always look for ways to capitalize on unique opportunities. Be sure to set high standards and demand nothing short of excellence from yourself and others. By practicing self-discipline and control, you will be successful in everything you do. The card may also represent an organization that prospers because of skilled management. In a well-ordered establishment such as this, supervisors lead with integrity and strive to bring out the best in their workers. 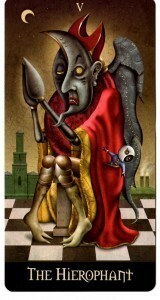 When reversed, the King of Pentacles often represents a materialistic person fueled by greed. Beware! This crook may try to swindle you out of your hard-earned money. He might disguise himself as an honest financial consultant or a sincere investor. In this position, the card could also signify a supervisor who exploits his underlings for profit. Perhaps you are the corrupt one! If so, you must realize that you are only cheating yourself! It is time to turn your dishonest values around, for your lust for gain will only cause you to lose your soul in the end! In this position, the king might also symbolize business mismanagement. A once promising venture will fail because of inefficiency, fraud, or unethical practices. I originally intended to use coins for this suit rather than pentacles. The borders of the cards were to be royal purple, and the images would have pictured wealthy citizens dressed in 18th century fashions. However, by the time I began working on them, I realized that the opulent theme I had planned, as well as the color palette, would have been similar to what I already created in the Suit of Cups. At that point, a dark, gritty, industrialized premise seized my imagination. Decaying factories replaced Arabic style palaces, and a blackened color theme absorbed the jeweled colors in darkness. This entry was posted in Announcements, Authors and Artists, Books, Decks and tagged Deviant Moon Tarot on September 1, 2012 by USGS Staff. We are pleased to share with you some sample pages from Patrick Valenza's upcoming Deviant Moon Tarot companion book. A long awaited treat, this book expands upon Valenza's vision of his celebrated deck. We know you will enjoy seeing some of the early sketches of this terrific deck. unpredictability and the chance that things may not develop as imagined. mixed feelings about the perpetual responsibilities that lie ahead. universe will complete this unique creation. neglect or a lack of dedication may also lead to your creations demise. and encroach upon the countryside. 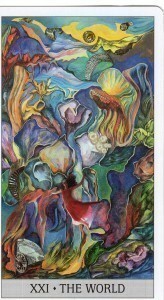 This entry was posted in Announcements, Authors and Artists, Books, Decks and tagged Deviant Moon Tarot on August 30, 2012 by USGS Staff. Tomorrow, February 7th brings us a Full Moon in the sign of Leo. Native American tribes refer to it as the Full Snow Moon, the Little Famine Moon, or the Full Hunger Moon, referencing the time of year, weather conditions, and how the tribes were affected. Leo brings in the energy of an increased sense of purpose, and how we creatively express that purpose. The Full Moon itself is viewed by many as a time for bringing to fruition the seeds that were sown during the New Moon, and releasing those things that are no longer working for us. While I do hold that to be true, I also believe that the full energy of the Moon can be used to begin new projects. The choice of releasing the old, bringing in the new, or doing a combination of both is up to each individual. We will be looking at our individual freedom (which is rapidly changing as the structures that make up our society change), as well as our responsibility to community (local and global). We need to take care of ourselves – to create personal time, to take the time to meditate, ground ourselves, and connect with whatever we accept as Spirit. A new paradigm is coming into being – as we adjust to it, we need to find our sense of balance in life – personal/professional, work/play, family/self … the list goes on. Leo is all about spontaneity and freedom of expression. It is also good to remember that Leo is a Fire sign – it wants to be out and about and doing things! It is time to share stories, and to allow ourselves to grow from both sharing our own stories, and listening to other people’s stories. Leo also asks us to express our dreams and hopes for the future. To do this, we need to be grounded in the present. 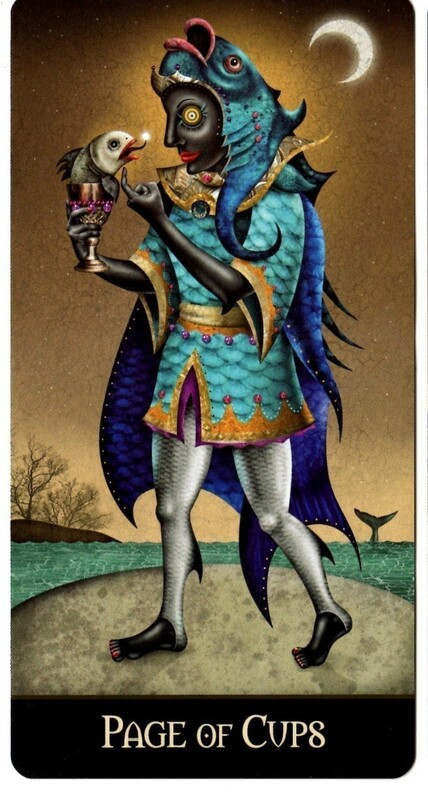 Other energies to keep in mind as we navigate the Leo Full Moon are those of the Hierophant (2012 is a number five year, relating to the Hierophant in the Tarot), and the Dragon (from the Chinese New Year, which started January 23rd). The Leo Full Moon has a partner in all this – the Aquarius Sun. While the Leo Full Moon is more about individual self-expression, the Aquarius Sun brings our energy and focus to the common good, towards helping humanity as a whole. It is all about community, groups, and social causes. Push/Pull between individual good and common good. One way to share our stories is through divinatory readings. I am going to add the small thought here that these readings can be done as individuals, or they can be done within a group setting. Or we can read as individuals with a focus on global issues/connections. Do what feels right for you. This is my offering for the Leo Full Moon. 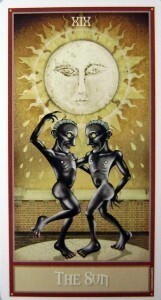 Cards were drawn from Patrick Valenza’s “Deviant Moon Tarot” . The Seeker is conscious of new information coming into a situation, and, on a more personal level, of the influences that a possible romantic interest is bringing into their life. It can well be that the new insights, and new opportunities, are opening up because they are opening themselves up to another person. The Seeker is not yet conscious of the fact that they are accessing their imagination, and their creative/emotional self. They are beginning to experience and express a greater degree of compassion in their life. What is coming into the consciousness of the Seeker is a need to get to the truth of things – in their own life, and in the world around them. During this time, the Seeker will be walking alone. The Seeker literally needs to release their need to control everything, and to be the one that makes things happen in their life. They need to step back, take a time out, and learn to flow with life, to allow Spirit to do its work. What the Seeker needs to bring in is the ability to make decisions on the fly (sometimes pondering too much is not a good thing! ), to allow themselves to be impulsive from time to time, and to go on a journey that may come to them in a very sudden manner. The Seeker can access their creative self by being willing to nurture themselves, to give themselves time and attention. They also need to open themselves up to the feminine mysteries. The Seeker needs to be willing to birth their own ideas. The Seeker can best express themselves in a creative way as an individual by living their life in harmony with those around them, by not creating or adding to conflict. The Seeker can best express themselves in a creative way in community by going within themselves, recognizing the answers they will find there, and sharing the strength of that wisdom with others. The new goals that the Seeker is forming are coming out of the previous cycle of their life – they are at a point where their life is coming together on all levels. They need to take the time to enjoy being “whole”, they need to enjoy their sense of “victory”, before they move on to the next level. The goals that percolate during their time of celebration will be the ones they take into the next cycle of their life. The new goals are taking the Seeker into the land of opportunity, into a time of success, prosperity and abundance in the physical world, but also into a sense of balance between their physical and spiritual worlds. I would love to see comments on this interpretation – to see how others interpret this spread! Scans were taken from the “Deviant Moon Tarot”, Patrick Valenza, U.S. Games Systems., Inc, 2008. This entry was posted in Esoterica, Spreads, Tarot Symbolism, The Cards, Uses for Tarot and tagged Bonnie Cehovet, Deviant Moon Tarot, Full Moon, Full Snow Moon, Patrick Valenza on February 6, 2012 by USGS Staff. 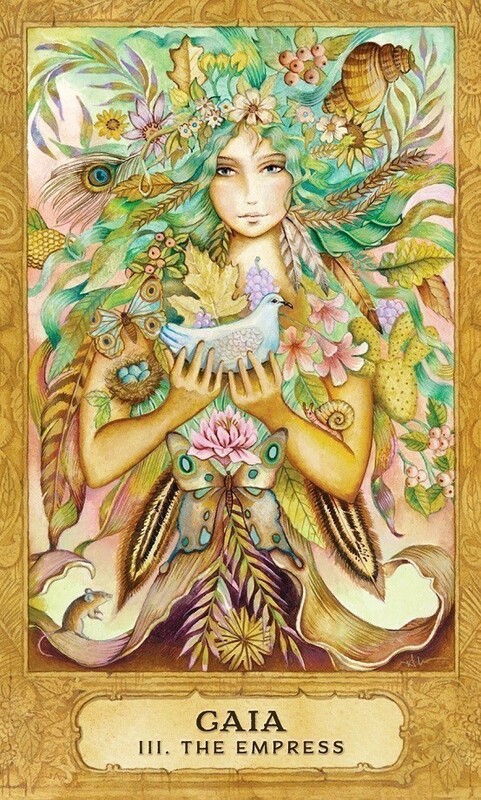 One card that represents giving is the Six of Pentacles. 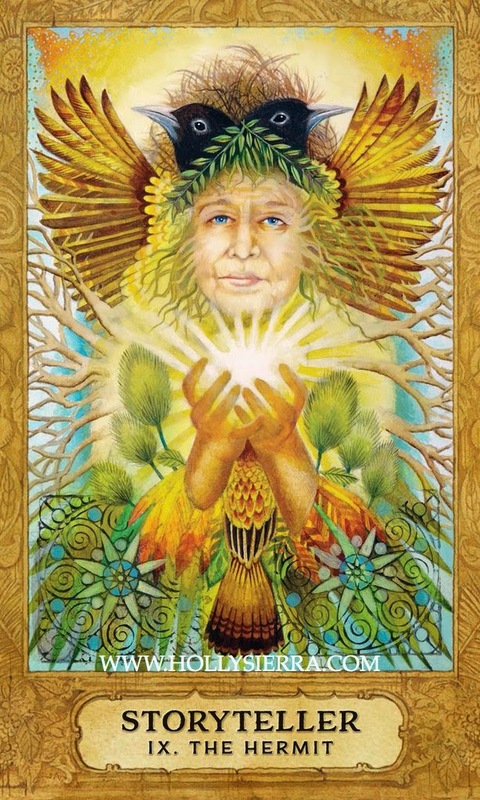 Right now is a big Six of Pentacles time for many of us because it's the holiday season. Shopping is fun for some and not-so-much for others. Personally, I like to avoid the malls. A friend of mine, however, dives in with glee. He tells me that shopping energizes him and the more people the merrier. How about you? Malls? Online shopping? Something in between? Well, what about those small, independently-owned stores? U.S. Games Systems, Inc. would like to give a big shout-out to the independent retailers. Without them, many of us wouldn't be able to pick up that newest Tarot deck or unusual deck of cards. And aren't some people just hard to buy for? Who is the hardest person on your holiday list to shop for? Do you use Tarot to help you come up with a gift idea? Maybe pulling a card with the intent "What does (person's name) want the most for a holiday gift" would give you an idea. If you try it, let us know! Please do let us know where you shop. We'd love to hear about your favorite indie stores in your community. Feel free to share their website or concrete store address here. Let's spread the love for those who help us find what we enjoy. Cards shown are the 6 of Pentacles from the Whimsical Tarot and the 6 of Pentacles from the Deviant Moon Tarot. © December 2010 U.S. Games Systems, Inc. This entry was posted in The Cards, Uses for Tarot, USGS Company and tagged 6 of Coins, 6 of Discs, 6 of Pentacles, Deviant Moon Tarot, Holiday, Independent Retailer, Shopping, Stores, Tarot, Whimsical Tarot on December 8, 2010 by USGS Staff. So did you guess correctly that Wednesday's mystery card was Temperance from the Rider-Waite Tarot? what do you know about this card? 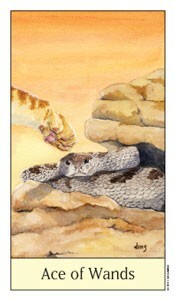 When you get it in a reading, how do you generally interpret it? Did you know that the Visconti-Sforza Temperance did not have wings? I think that her hair gives the idea of wings. Do you agree? Did you notice that she doesn't have anything flowing from her jugs? You are just left to imagine that she is transferring something. The colors are reflected in the Rider-Waite. Her red arms become the angel's red wings. Her blonde hair is the same only shorter. Her feet don't touch water and earth like the Rider-Waite Temperance, but both have mountains in the background. Another bit of trivia about this card is that it is thought that this card was done by someone other than the artist who did the majority of this deck. Why it is a different artist seems to remain a mystery though. Patrick Valenza takes a unique look at Temperance in his Deviant Moon Tarot pictured above. His moon-faced winged woman is a far cry from what I imagine Plato thought of when he offered up his virtues. Did you know that some people refer to Temperance as Restraint? How does that change your own opinion of this card? Do you already read that as part of the card's meanings? The curious face of this Temperance draws me in. Is the hidden face of the moon peeking out the one we need to focus on? When you compare it to the sweet and simple angel of the Tell-Me Tarot, do you get different meanings or not? Something else to review is which hand is up and which is down? 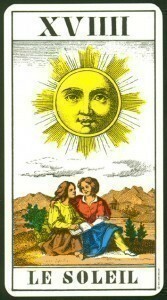 Below are the Temperance card from the Tell-Me Tarot and from the Archeon Tarot. What are some things that you see in all of these cards? What is missing from the original Rider-Waite in these others (or re-interpreted) that you notice? What is a Temperance card that you love? Is it one of these or does another one catch your fancy? Think about the colors as well as the vessels in use. What are they pouring? Is it tangible or not tangible? What does that mean to you? Looking forward to talking about Temperance…in moderation of course. And, just for fun, here's Angel from Buffy the Vampire Slayer. 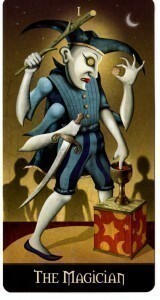 He's Temperance in that unpublished Tarot deck from Rachel Pollack and Paul Lee. 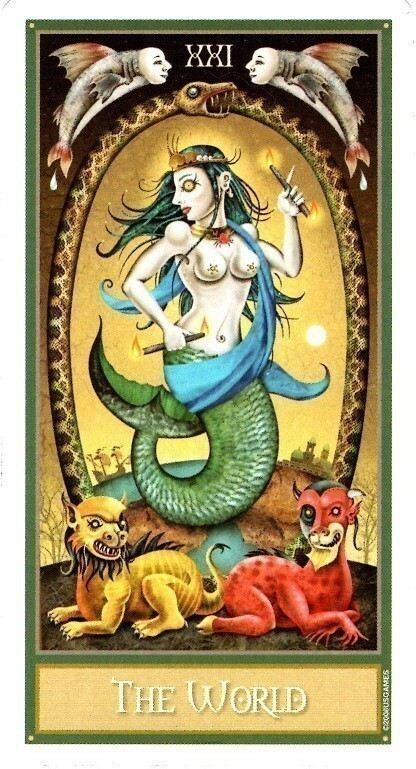 This entry was posted in Archetypes in the Tarot, Decks, Esoterica, Games and Trivia, Guess the Deck, Tarot History and tagged Buffy the Vampire Slayer Tarot, Deviant Moon Tarot, Major Arcana, Rider Waite Tarot, Tarot Cards, Temperance, Visconti-Sforza on December 3, 2010 by USGS Staff.